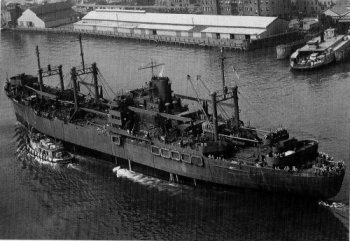 Dimensions 468'8" by 63' by 23'3"
The Sumters were standard Maritime Commission C2 cargo vessels converted to attack transports (as standard type C2-S-E1) and closely resembled the Ormsbys. They were equipped with 5 LCMs and 19 LCVPs. None were lost in the Pacific.